Barb Rentenbach is a woman with autism spectrum disorder that renders her mute, and she communicates by typing. Lois Prislovsky is her therapist, and also has ADHD. The two have collaborated on a number of projects, including a podcast where Barb's typed sections are read by her psychiatrist. The two alternate chapters in this book, discussing aspects of their personal lives and then giving practical advice on how to deal with similar situations. Their focus is on celebrating and respecting all people, regardless of how their brains function. There is a lot of humor in this book, and the chapters are short and easy to read. It can sometimes feel disjointed, as the brevity of the chapters means that sometimes a topic first mentioned in one chapter isn't dealt with until later ones. The humor helps, as they are addressing concerns that many people have, even if they don't have the specific label. Someone doesn't have to be autistic or have been diagnosed with ADHD or anxiety in order to appreciate this book. There are excerpts of therapy sessions as well, so people that might find the idea of seeing a therapist intimidating can see that it really is a conversation about how to be the best person that you can be. This is a very approachable and easy to read book, and helps bring humanity back to the labels that people carry. Rentenback and Prislovsky sounds like a good team, lots of these nonfictionbooks aren't that great to read because they lack humor so this sounds like a good book. Thanks so much for the feedback. It really is an easy to read book, it's almost as if you're in a conversation with the authors. Nicely done. Thank you for sharing with us! You're very welcome! I really did like reading the book. Sounds like this would be a useful book for a few parents I know that have autistic children. Since Barb herself has autism, it would probably help them try to picture how their children's minds work. “…celebrating and respecting all people, regardless of how their brains function” there couldn’t be a better goal! 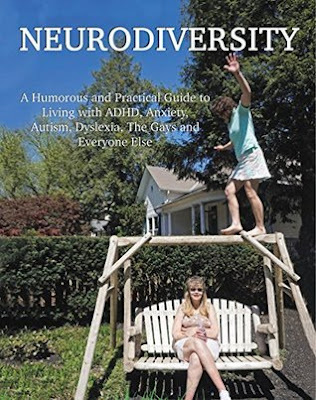 Thank you for sharing about Neurodiversity, I will have to check that out. You're very welcome! I haven't heard the podcast, but that might be interesting to listen to, too. This book appears to cover a wide spectrum of disorders as well as diverse lifestyles. Ambitious authors. The humorous approach is what interests me most. This sounds like a helpful book. I like it when difficult subjects are handled with humor. Great review!